In collaboration with artists ranging from Plácido Domingo to Sting, Camille Zamora has garnered acclaimed for her “dramatic and nuanced” interpretations of repertoire ranging from Mozart to tango. "A SINGER BLESSED WITH INTENSE COMMUNICATIVE ABILITY WHO BLAZES WITH PASSION." 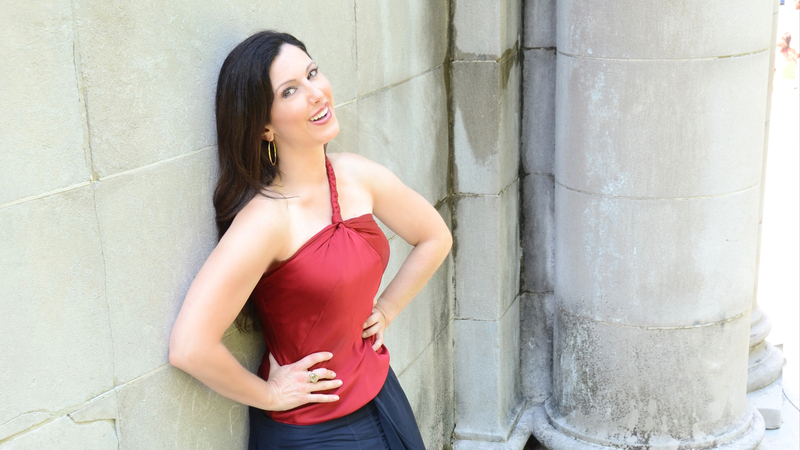 “A singer blessed with intense communicative ability who blazes with passion” (Opera Magazine, UK), Camille Zamora balances a vibrant career of opera, recital, and concert performances. In collaboration with artists ranging from Plácido Domingo to Sting, Camille has garnered acclaim for her “dramatic and nuanced” (The New York Times) interpretations of repertoire ranging from Mozart to tango. She is known for her “dignity and glowing sound” (The New York Times) in “luminous, transcendently lyrical” performances (Opera News) that “combine gentility and emotional fire” (The Houston Chronicle). Recent seasons have featured performances with Yo-Yo Ma at the US Capitol, her Kennedy Center recital debut, and seven new operatic roles, including the tour de force double-bill of La voix humaine and I Pagliacci, which was cited as “Favorite Performance of the Year” by The Columbus Dispatch. Camille sang the principal soprano role in Hindemith’s The Long Christmas Dinner with American Symphony Orchestra at Lincoln Center, the live recording of which topped The New York Times’ Classical Playlist and was one of Opera News’ Best Recordings of the Year. Other recent highlights include Granados songs with Yo-Yo Ma and Cristina Pato in the award-winning documentary film The Music of Strangers, American Songbook classics by Gershwin, Berlin, Ager, and Arlen with The Late Show with Stephen Colbert bandleader Jon Batiste in Los Angeles and New York City for the opening of the new Steinway Hall, and Twin Spirits: Robert and Clara Schumann at Lincoln Center and LA’s Music Center in collaboration with Joshua Bell, Jeremy Denk, Nathan Gunn, Trudie Styler, and Sting. Hailed as a leading interpreter of classical Spanish song by NBC Latino and the Congressional Hispanic Caucus, Camille has performed and recorded principal roles in the zarzuelas La Verbena de la Paloma, La Revoltosa, Luisa Fernanda and La Tabernera del Puerto. Her performances of classical Spanish repertoire have been heard on five continents, in venues ranging from Carnegie Hall to Zimbabwe’s Harare International Festival. Tango Caliente andSueños de España, Camille’s concerts of classic Spanish songs arranged for her by Grammy® Award winner Jeff Tyzik, tours nationally under Tyzik’s baton and has been presented with Fort Worth Symphony, Milwaukee Symphony, and Florida Symphony, with upcoming performances with Dallas Symphony, Edmonton Symphony, Rochester Philharmonic, and others in future seasons. Camille has sung with many of the world’s leading orchestras, including Orchestra of St. Luke’s, London Symphony Orchestra, Guadalajara Symphony, and American Symphony Orchestra, and in live broadcasts on NPR, BBC Radio, Deutsche Radio, and Sirius XM. She performed Brahms’ Liebeslieder with Leon Fleisher at Aspen Music Festival, Beethoven’s Mass in C at Alice Tully Hall, Mahler’s Symphony No. 2 “The Resurrection” with Chattanooga Symphony, Handel’s Messiah with Tucson Symphony, Schubert Lieder for the opening night of American Ballet Theater at City Center, Bach’s Magnificat at Carnegie Hall, and, also at Carnegie Hall, the premiere of Christopher Theofanidis’ Song of Elos, a performance she repeated at the American Academy in Rome. A champion of contemporary music, she made her Lincoln Center Festival debut in Bright Sheng’s Poems from the Sung Dynasty for Soprano and Orchestra and premiered Grammy® Award winner Robert Aldridge and Herschel Garfein’s Away, but Not Far Away at Cooper Union’s Great Hall. She has performed Aaron Jay Kernis’ Simple Songs for Soprano and Orchestra under the baton of the composer, and works of Ricky Ian Gordon with the composer at the piano at Lincoln Center. She has also premiered works by Franghiz Ali-Zadeh, Bernd Franke, Roberto Sierra, Henry Brant, and Richard Wargo with companies including Spoleto Festival USA, New York Festival of Song, Continuum, and American Opera Projects. In addition to her award-winning original language premiere of Hindemith’s The Long Christmas Dinner (Bridge Records), Camille’s recordings of twentieth and twenty-first century works include The Music of Chris Theofanidis (Albany Records), Strauss’ Die Liebe der Danae(ASO), New Music with Guitar / David Starobin (Bridge) and Scott Gendel’s At Last with Yo-Yo Ma on An AIDS Quilt Songbook: Sing for Hope (Naxos/GPR). An advocate for the arts in education, Camille is the Co-Founder of Sing for Hope, a leading “arts peace corps” that mobilizes artists in service and presents initiatives – such as NYC’s Sing for Hope Pianos – that make the arts accessible to all. She has presented and performed at the US Capitol, The United Nations, Fortune Most Powerful Women Summit, Skoll World Forum at Oxford, Opera America, and Aspen Ideas Festival, and is a regular arts and culture contributor to The Huffington Post. A 2016/17 Kennedy Center Citizen Artist, Camille has been honored with a World Harmony Torch-Bearer Award, a Congressional Hispanic Caucus Recognition, a 100 Hispanic Women Community Pride Award, and been named one of the Top 50 Americans in Philanthropy by Town & Country, NY1’s New Yorker of the Week, and one of CNN’s Most Intriguing People. Camille is a graduate of The Juilliard School.